Awhile ago when still living in Jersey a friend invited me to a "Jar Party". It's not what you think. No Tupperware, lotion/potion or candles to be had. Thank goodness, I can't stand those things. The pretense was a gathering of people, women in this case, encouraging, discussing and sharing our goals with each other and ourselves. Each person was given a jar and a number of pieces of paper two write on. We were given a number of minutes to write down our goals for the next year. They did not have to be specifically art related but we were all artists in some respect. I was surprised what came out of myself. Those pieces of paper were placed in a jar and taken home. I moved to Vermont shortly after this and my jar of goals, as the rest of life was packed and placed in storage for many months. I got my studio the beginning of June and proceeded to unpack. This took me a few months as I only unpacked necessities first. My jar was discovered just about a month or so ago and I was shocked to read my goals from the year before. I was so far behind. As I start October I am trying to keep these reminders with me always to try and get at least a few things complete by years end. It's a wonderful exercise if you'd like to try it. I wish you luck as I hope you wish me the same. A recent class demo done from our fabulous model Astrid. An amazing video from TED worth sharing. Discussing the importance of creativity and the arts in our lives. 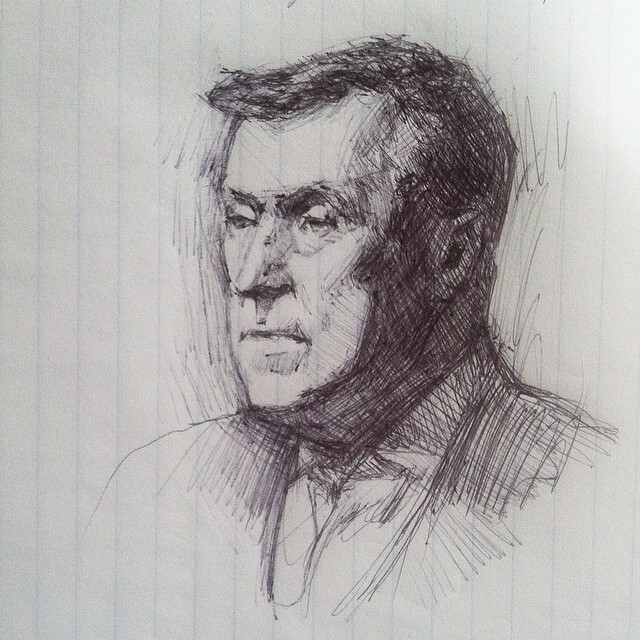 Had the pleasure of drawing while monitoring at the Salmagundi Club today. These are the results. Recently I was talking to a student about the scale of “Polish and Panache” as quoted by Michael Aviano. I referred my student to one of my favorite artists, Ron Sherr, as an example of a well executed balance of the scale. I truly enjoy these pieces and hope that you will too. I am proud to announce that I have received the privilege and honor of being part of the Ani Art Academy’s “Capturing Realism 2011” Exhibition, with my piece titled “America the Beautiful”. Above is the video preview, including a few select works from this years show. The show is a phenomenal display of extremely talented artists working with The Ani Art Academy Waichulis, Jahn Studios and The Studio of Joel Carson Jones. The show will run from October 29 to December 10 at The Pauly Friedman Art Gallery at Misericordia University. The opening reception is Saturday, October 29, 5-8 pm. Join us! I meet with an old friend recently, and had the pleasure of meeting a new friend too. As promised to this new friend, here is the “Flowering Staircase”, as Timothy Stotz, its creator, calls it. It is a visual guide, linking a number of great artists lineage together. I find myself a product of this staircase, two generations down. I hope you can find yourself connected to it too. For a complete list of the art and artists shown in the video visit > http://www.maysstuff.com/womenid.htm After you have seen the video. Value can be a very confusing thing. Here is an example of how your eyes fool you. 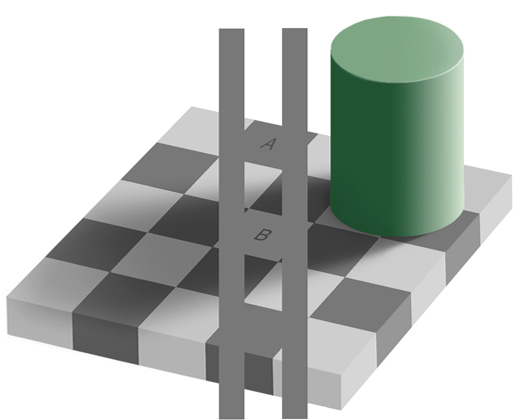 Edward H Adelson’s Checkerboard Shadow Value Illusion. The squares marked A & B are the same value. To my students. In class we briefly discuss form and value. Here is a short “webisode” by Scott Waddell, that describes in a little more detail, with clearer illustrations, what we discuss in class. As I have had a few students ask me to post information covered in class up, this post I will cover palette set up. Next, as the Masonite is very absorbent when new you must prime the surface, to prevent it sucking the oil out of your paint within minutes. Take a paper towel and rub 2tbs. of linseed or stand oil, with 1tbs. odorless mineral spirits (OMS) into the top of the palette, allowing mixture to absorb into Masonite. Let stand 2-5 min. until fully absorbed. Repeat this step at least 4 times before using palette. **NOTE** dispose of paper towels in firesafe or outside garbage can, as they have been known to spontaneously combust. Now your ready to layout your colors. My palette set up has been handed down to me, from Timothy Jahn and Brian Townsend. It is a impressionistic color palette laid out in a color wheel. Follow image above for set-up. 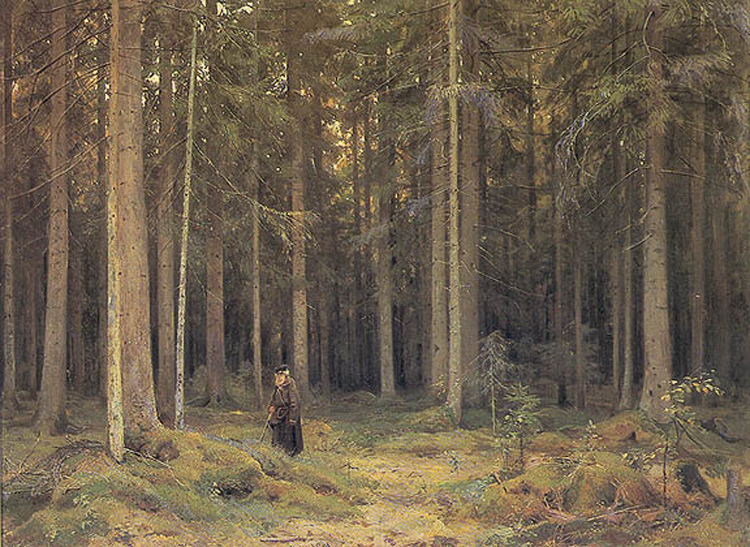 "The Forest of Countess Mordvinova" 1891"
Ivan Ivanovich Shishkin (Russian: January 1832 – 20 March 1898) was a Russian landscape painter closely associated with the Peredvizhniki movement. I’ve been recently really enjoying the colors during early winter sunsets. This is due especially to the lack of foliage on the deciduous trees. The warmth the sunset puts on all the pine trees is absolutely beautiful. 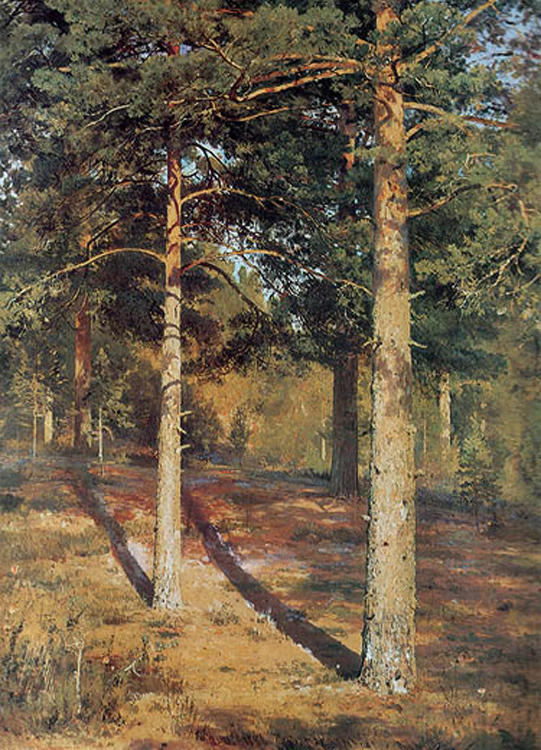 It always makes me think of Shishkin. 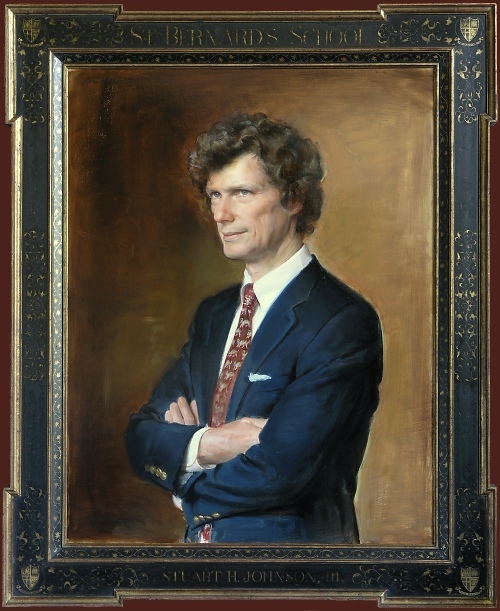 I stumbled upon this painter a number of years ago and instantly fell in love. One of the things that is so wonderful about these works are their ability to tell a story and set a mood in a landscape. I will continue to be amazed by them as I hope you will be too.